Sometimes we need to cut down trees to remove them, but chopping trees down to the ground does not stop them putting out new growth from the stump or from the roots and eventually turning back into full sized trees again. In fact, the technique of cutting trees down to a stump and letting them regrow is called coppicing, it’s a traditional woodland management technique and many trees can be coppiced for timber harvesting or other reasons and successfully regrow. To get rid of a tree stump, you don’t need to chop or dig it out of the ground, use expensive machine or poisonous chemicals. Why avoid chemicals marketed as “Blackberry & Brush Killer” or “Tree & Blackberry Weed Killer”? You seriously do not want to contaminate your garden with these persistent poisons! Tree & Blackberry Weed Killer, Blackberry & Brush Killer and other such herbicides used for killing tress, woody shrubs and vines all contain triclopyr BEE (butoxyethyl ester), a selective systemic herbicide used for control of woody and broadleaf plants. It’s a schedule 6 (S6) Poison, which is the highest toxicity level of poison that the general public is legally allowed to buy, and it’s going in your living space… Once it’s there, it will be around for a while too. Being a systemic herbicide, it soaks right through the plant or tree, making all parts of it toxic. The herbicide actually remains active once it’s in vegetation, even if it’s decaying. The safety sheets for triclopyr BEE sold to the agricultural market (sold under the trade name Garlon or Release) clearly state “DO NOT burn off, cut or clear for 6 months after treatment.” The contaminated waste contains active herbicide will still kill other plants and trees and burning it creates toxic fumes. This is not mentioned at all in the same products sold to the general public, which is highly irresponsible. Any triclopyr BEE applied will not stay at the site of application either. Soil mobility refers to how easily a chemical can wash away, move through soil and affect non-target plants and trees, as well as contaminate the water table or wash into waterways. Since triclopyr is mobile in soil and moderately persistent it has a potential to leach into soil and groundwater and to contaminate drinking water. In terms of toxicity, triclopyr is considered moderately toxic to mammals and oysters, and low in toxicity to birds, insects, fish and crustaceans. So, you can go the ‘man versus Nature’ chemical warfare approach and use triclopyr, which will contaminate your living area and the environment, or you can kill a tree stump much more safely and cheaply using a more sensible approach. In Permaculture’s design principles, we have the Attitudinal Principle – “Everything Works Both Ways”. Whether we see something as positive or negative, as a ‘problem’ or as a useful resource, depends on our attitude. Typically, people see a disadvantage as a ‘problem’ and then implement an energy-intensive ‘solution’ to attempt to ‘fix the problem’. The other option is to take a different attitude, look at everything as a positive resource, and figure out how to make use of it! We can get creative and think of all the ways we can turn these disadvantages into useful things we can use in our system. With this in mind, have you ever accidentally killed a young tree or plant by over fertilizing, or known anyone that has? It happens all too often, with people getting carried away with large amounts of chicken manure in their garden, and especially with young citrus trees because gardeners hear that they’re ‘heavy feeders’ and over-feed them! When excessive fertilizer is applied around the roots of a plant or tree, it creates a high concentration of salts in the soil, and through osmosis, water naturally moves from areas of low salt concentration to areas of high salt concentration to equalize the proportion of water to fertilizer salts. What large amounts of fertilizer do is draw water out of the roots, drying the plant or tree out, causing the symptoms of lack of water, such as leaf burn, and if the desiccation is extreme enough, the death of the plant or tree results – this phenomenon is called fertilizer burn. The osmotic desiccation of plants through fertilizer burn can be a problem when over-fertilizing, but it can be used to our benefit to kill tree stumps too, with a few subtle changes to the process! 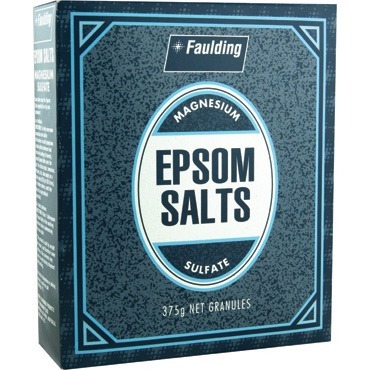 Epsom salts is nothing more than magnesium sulphate, people use it in their baths to relax, and gardeners use it as a supplementary nutrient to rectify magnesium deficiencies in plants and trees. It’s also readily available, cheap and completely safe for people and the environment. Large amounts of Epsom salts will draw moisture out of a stump much like an over-application of fertilizer does to roots, eventually drying it out, after which it will just naturally rot away. Any magnesium released into the soil will just be taken up by plants – magnesium is the key element in chlorophyll which allows plants to photosynthesize and makes leaves green. A drill with a long drill bit about 25mm (1”) wide. 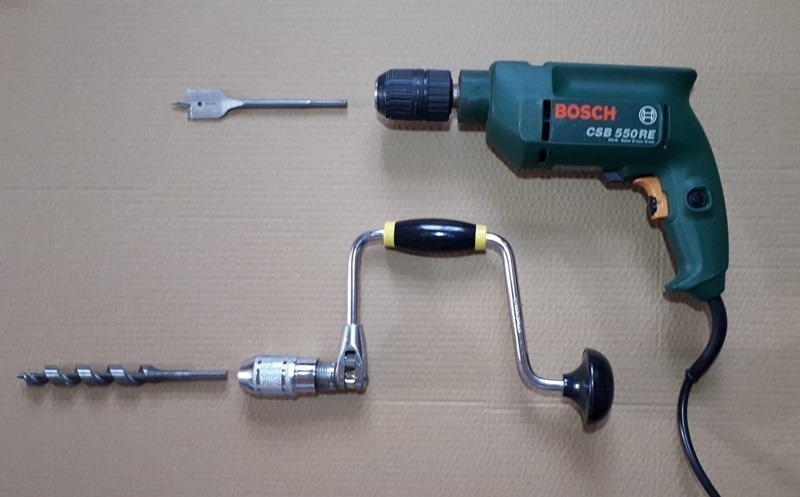 You can use a drill with a spade bit or an auger bit as shown below. Drill holes into the top of the tree stump, using a 25mm (1”) drill bit. Drill holes at least 15-20cm (6-8”) deep using a spade bit or auger bit. On larger stumps, space the holes around 7-10cm (3-4”) from the bark edge and from each other. On smaller tree stumps aim for six or more holes. The intention is to create enough holes that run deep enough to hold a sufficient amount of Epsom salts so that it can more easily penetrate into the wood and the roots to dry them out. Fill all the holes with dry Epsom salts all the way to the top. Slowly add just enough water to each hole to moisten the Epsom salts – it doesn’t need to be really wet, just moist, and be careful to not wash the Epsom salts out of the holes. To prevent the Epsom salts being washed out by rain, cover the stump a sheet of plastic, a garbage bag or a tarp, and anchor or fasten down the cover so it doesn’t get blown away by the wind. That’s all there is to the process, it’s fairly straightforward! Additionally, if roots extend from the side of the stump, they too can be drilled and filled with Epsom salts. 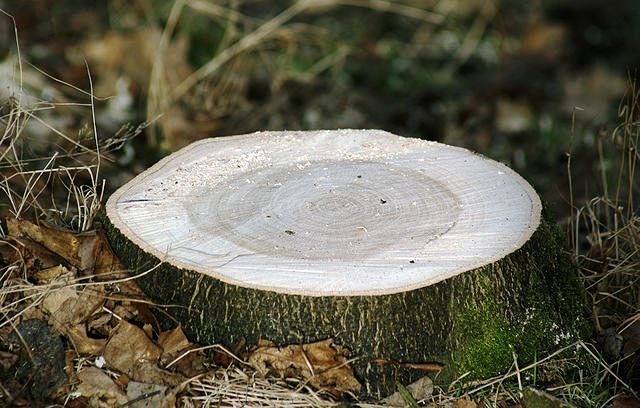 If the stump if freshly cut, once it is drilled and the holes are filled with Epsom salts, the whole surface of the stump can also be cover with a thick layer of Epsom salts to speed up the drying process. The stump can take up to six months to dry out, depending on the size of the tree and its root system. Check the stump each month to see if the level of the Epsom salts in the holes has dropped as it’s been absorbed. If it has, top up the level of the Epsom salts and moisten as before. Hopefully you won’t have to kill too many trees on your gardening journey, but if you do have to remove a tree, this is definitely a much better way to get rid of living tree stumps than contaminating a garden with poisonous chemicals! This entry was posted in Gardening Information, Pests, Diseases & Problems, What's New! and tagged Blackberry & Brush Killer, Blackberry Weed Killer, epsom salts, Garlon, kill tree stump, organic gardening, triclopyr BEE (butoxyethyl ester). Bookmark the permalink. I’ve seen in the wet climate of Wales, a stump sort of dug out like a cup and full of water, then that rotting the inside and it going all fungi full. It might have just been a fluke, but I am considering doing that on a sycamore here. I would imagine that carving the stump into a bowl would be harder than drilling! Water or fungi rotting the stump won’t always kill the tree though! I have an interesting story to share on the matter. My fig tree had been once chopped to a stump (I didn’t do it!) and a shoot growing out from the side of the stump formed its new trunk. It was a decent 3m high tree with a trunk as thick as a person’s leg, but unfortunately the right-angled bend where the trunk grew from the stump was weak, and the wind tore the trunk off the old stump, it sheared it off, much to my disappointment as the fig was loaded with buckets of half-ripe fruit. Thinking the tree was finished, I placed a compost bin over it to compost the stump, and composted garden clippings and bokashi processed kitchen scraps for months. One day, a cluster of new shoot emerged from the old roots under the soil around one side of the compost bin. I chose the biggest strongest shoot to retain and removed all others. I now have a nice productive fig tree with a strong straight trunk, rooted firmly in the ground, and the old stump is still under the compost bin. A shoot also emerged on the neighbours side of the fence, in a narrow gap of soil between the fence and their concrete, and they didn’t want me to remove it, so I espaliered it on their side of the fence for them. Now we both have a new, productive fig tree each! After reading your comment, I’m starting to feel that figs are prolific. My sister has oodles of fig cuttings that took and are growing nicely around a foot high in pots. Unfortunately, I do find the fruit yucky, well apart from hen inside figgy biccies, which are healthy. So just maybe I will pop one into my garden, for the possible biccy making properties. Maybe also like your neighbour, the next person to live here will love them or the birds. As for the sycamore, it’s big enough for fire wood and might do well as a coppice. Very interesting article! Do you think it would work with Camphor Laurel? It will work on any tree that needs water to live, that covers all of them, so that would include camphor laurel too! would this method kill large living fig trees? Yes it would if you chopped the tree down first.